Trampolines for teens There are 23 products. 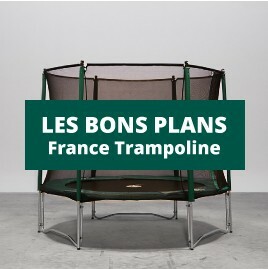 This family sized trampoline of 3.66 m in diameter is the most sought-after trampoline for children. This 12ft Jump’Up 360 trampoline with enclosure is delivered with a complete pack of accessories. A ladder, an anchor kit and a protective cover. A care free pack to keep your trampoline for years to come. Its 180 mm long springs will provide users with dynamic jumps! Booster 360 round trampoline with safety net. A high-quality, very performant trampoline that will evolve with your children. With its powerful springs and sporty appearance, the Booster is the ideal partner for athletes of all ages. This big 3.96 m Jump’Up is a family sized trampoline with an unprecedented diameter! Booster 360 Trampoline Maxi Pack, with safety enclosure, including step-ladder, protective cover, and anchoring kit. A safe, quality trampoline, built to last! Keep your Jump’Up 390 safe and clean thanks to this complete Maxi Pack. This pack includes the 13ft Jump’Up 390 trampoline with enclosure, ladder, anchor kit and premium protective cover. This trampoline provides a generous jumping surface. This round 13ft trampoline will seduce sporty families looking for a high-performance and resistant leisure trampoline. This round 14ft trampoline will seduce sporty families looking for a high-performance and resistant trampoline. The biggest trampoline in our Jump’Up range! A complete maxi pack to keep your Booster 390 trampoline like new! This pack includes a 13ft trampoline, a safety enclosure, a ladder, an anchor kit and a protective cover. A big trampoline for maximum fun! This trampoline with a 10 square meter jumping mat provides a large jumping area. To keep you 14ft trampoline safe and clean, the Booster 430 is provided in a maxi pack with a safety enclosure, a ladder, an anchor kit and a premium cover. This 15ft Jump’Up 460 maxi pack is ideal for families who want to make the most ofd their trampoline all year round.